Racism and xenophobia are daily realities in Finland and immigrants commonly face different forms of racism, discrimination and xenophobia. 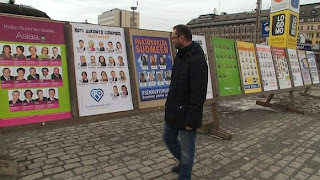 Although racism is no secret, it hits like a bombshell each time a glaring case, such as the racially motivated vandalism of municipal election posters in Mikkeli, is reported. Municipal elections in Finland are held every four years on the fourth Sunday of October. [Source] The next municipal election is scheduled to take place on 28 October 2012 and there have been efforts and campaigns aimed at increasing immigrants' participation in the election. One of such efforts is the iCount project by the Co-operation Network of Multicultural Organizations (Moniheli). Over the past couple of months, Moniheli and other organizations have disseminated information aimed at encouraging eligible immigrants to participate in the 2012 Municipal Election. The media has also tried to urge immigrants to vote. Such efforts have raised prospects and hopes of Finland becoming an inclusive society. But disturbing news of stickers with racist messages pasted on municipal election posters in Mikkeli, eastern Finland, has marred hopes that Finland is moving forward. According to Yle, the picture of a candidate with immigrant background was torn off and racist messages were posted on election posters. The reported racist vandalism cut across party lines. A change in Finnish legislation in 1992 allowed foreigners who have lived in a municipality for an uninterrupted period of two years to vote in Municipal Elections. Immigrant-voter turnout in Finland is 20% compared to 60% in other Nordic countries. [Source] Many immigrants - the majority of whom have been pushed to the fringes of society and limited to menial jobs due to exclusion and lack of diversity in Finland's professional work life - don't vote in elections, in my opinion, because they believe they don't have a stake in Finnish society. Racist vandalism of posters reveals that not everyone in Mikkeli welcomes the idea of immigrants participating in elections. Local branches of two political parties (Christian Democrats and the Greens) affected by the racist incident are reportedly planning to file a police reports. Filing a police report in a blatant case of racist vandalism is a move in the right direction. But it will take more than police reports to combat the canker-worm of racism and xenophobia in Finland. What the country needs is more and more immigrants exercising their right to vote and getting involved in local government affairs and decision making. Eligible immigrants should defy the odds and go out and vote. History tells us that the right to vote is a fundamental right that has restored, at least to an extent, the dignity of disadvantaged and discriminated individuals or groups in many countries around the world. More often than not, landmark changes - even in the most closed societies - come through the ballot box.